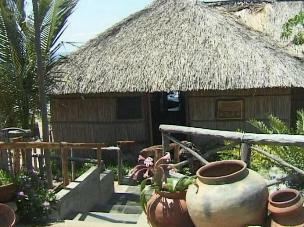 Jangamo Beach Resort is situated adjacent to Guinjata Bay Resort and shares the same beach. 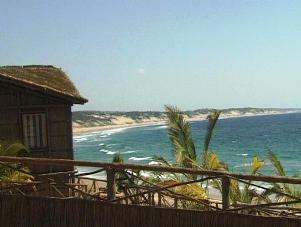 As at Guinjata the resort is set high on the dunes with a breathtaking view of the bay and beach. The resort's delightful bar, which is open all day is a popular place for sundowners and evening drinks, from where you can watch the whales and enjoy the beautiful sea view. The adjoining restaurant, which shares the astounding ocean view, offers a diverse menu including vegetarian, seafood, Portuguese and international cuisine. The area offers you miles and miles of unspoiled, sun drenched, golden beaches with clean, crystal clear waters. All activities and water sports such as fishing and dive charters as in the rest of the area, are on offer from the resort. The lodge offers a variety of accommodation to choose from either catered, or self-catering. It varies from double rooms in the main lodge, to en-suite cabanas that sleep up to six persons, with fully equipped kitchens. Deluxe villas sleeping 6 to 8 people, with 2 bathrooms and braai facilities, are also available.